Please click here for a selection of hotels in Amsterdam offering a special rate for the event. 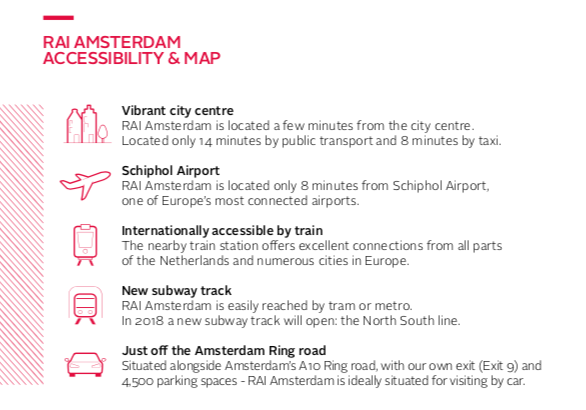 The Superyacht Forum is held at the Amsterdam RAI, located ten minutes from the main airport, Amsterdam Airport Schiphol, and just a few minutes from the city centre. The RAI allows our delegates to maximise the use of their time in the city. Held on 19 - 21 November 2019, the METSTRADE Show is the world’s largest marine equipment trade show and the only truly international B2B exhibition for the marine leisure industry. The SuperYacht Pavilion is a destination in its own right. Access is included with any of The Superyacht Forum passes. The annual superyacht industry rendezvous: where to network, when to get inspired for the upcoming year and how to partner with key players.